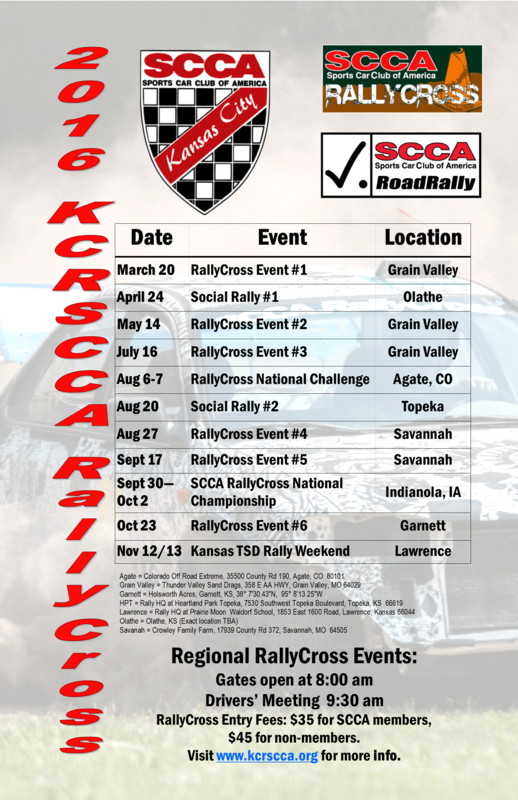 The much anticipated 2016 Kansas City Region SCCA RallyCross and Road Rally schedule of events is complete! We are expanding both programs this year with six regional RallyCross events, two social road rallies, and our traditional season-ending Kansas TSD Road Rally Weekend. In addition to the two new social rally events, we are also introducing a new RallyCross venue in Savannah, MO, just north of St. Joseph. This will be more convenient to our membership in the north, and to our northern neighboring regions. Individual event announcements will be coming soon! You can keep up with the latest by subscribing to our site (see the “Subscribe via Email” on the sidebar to the right), registering on our Forum, or joining our Facebook group. Tagged 2016, Rally, Rallycross, Schedule. Bookmark the permalink.